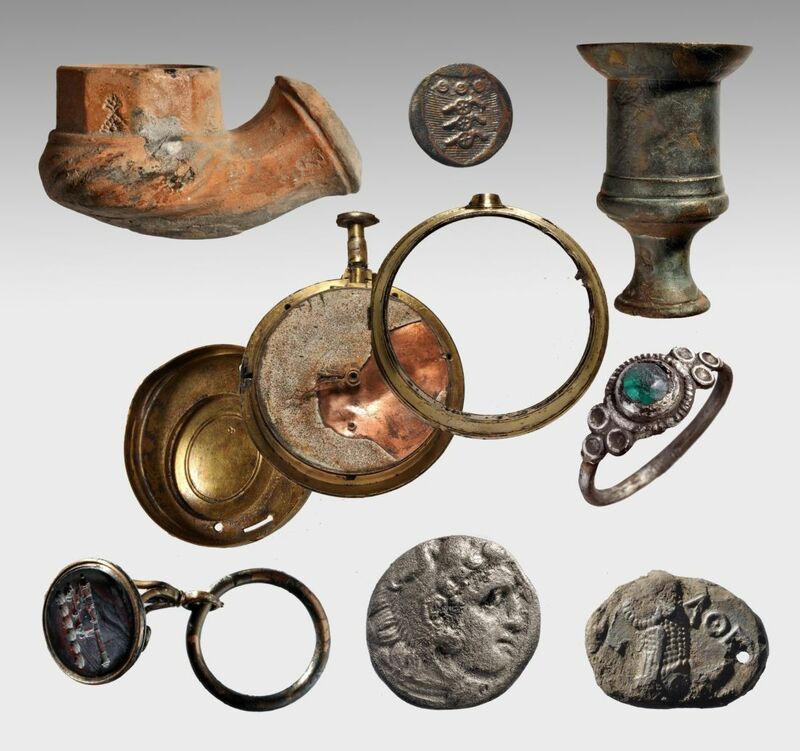 Egyptian statues, coins and jewelry among treasures Lord Elgin's brig Mentor carried when the overladen ship sank off Kythera. A trove of treasures, from ancient Egyptian statues to coins and amphorae with stamped handles, has been found inside the wreck of the Mentor, one of the ships used to transport the Parthenon marbles from Piraeus to England. The overburdened frigate sank in 1802 southwest of the island of Kythera. Even 200 years of depredation by looters failed to find all its secrets, which are now being uncovered by marine archaeologists. The precious marble slabs themselves were saved from the depths at the time: Lord Elgin lost no time ordering their salvage. In correspondence with the local vice consul of Great Britain seeking assistance, he wrote “she had on board some quantities of boxes with stones of no value, but of great consequence for me to secure”. 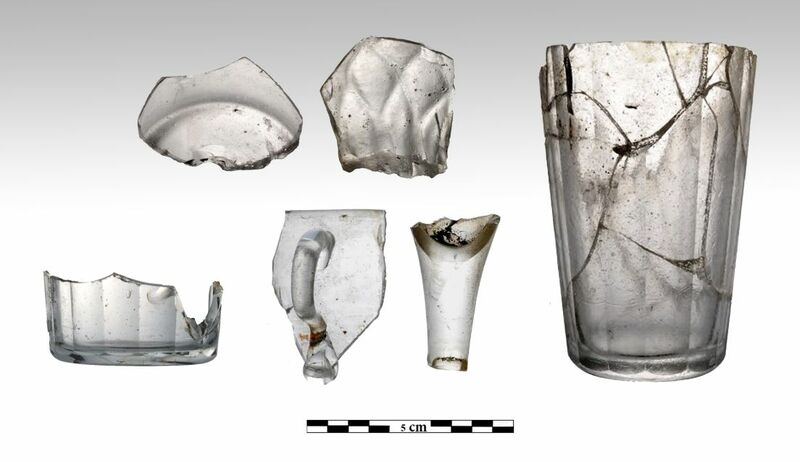 Now a team of marine archaeologists headed by the Greek Culture Ministry's Ephorate of Underwater Antiquities, Dimitris Kourkoumelis, has revisited the Mentor and excavated more of the hull, which had been badly damaged by looting and many salvage operations over the years. “We have uncovered the remainder of the hull, sections of the hull and prow, a mere quarter of the ship,” Kourkoumelis told Haaretz, adding that unfortunately the rest of the hull had been completely destroyed during the 19th and 20th century, by treasure hunters seeking more marbles that were rumored to have remained on the seabed. Thomas Bruce, the seventh earl of Elgin, was a Scottish aristocrat who was named British ambassador to the Ottoman court in Constantinople in 1801. Acting on a paper obtained from the pasha, whose abstruse language has been studied ever since with Talmudic fervor, Elgin, had parts of the Parthenon marble frieze pried loose from the Parthenon, the ancient temple of Athena on top of the Acropolis, and loaded onto his ship, the Mentor. On the September 15, 1802, the Mentor set off to Britain, carrying the marbles along with a cargo of priceless antiquities. The first port call was the island of Malta. Favorable winds brought the ship to Cape Matapan, the southernmost point of mainland Greece. Then a strong easterly wind developed, forcing it to spend the night there. But the next morning, the captain realized that the ship was taking in water. Already in Piraeus, as they were loading the cargo, the captain, William Eglen, had became embroiled in a heated argument with Lord Elgin's secretary because he thought the crates were too heavy for the Mentor. Eglen turned out to be right. Hoping to save the ship, he made for anchorage on the nearby island of Kythera. He almost made it. In the afternoon of the same day Mentor reached the small port of Avlemonas on Kythera but the weather was too bad for the ship to dock. The sailors tried moor the ship with two anchors off the port, but the anchors failed to hold the ship in the heaving sea. It swung onto the rocks, crashed and quickly sank to a depth of 23 meters. All the passengers and crew were rescued by the vessel Anikitos. Hearing of the disaster, Lord Elgin organized a salvage mission. 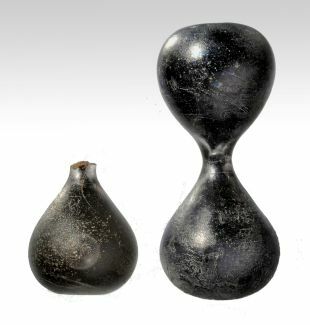 Using sponge divers from the island of Kalymnos, the marbles were eventually salvaged from the shipwreck, and shipped to Malta and onto the United Kingdom. Although the wreck has been plagued by treasure-seekers ever since, 200 years later, the shipwreck still turned up a treasure of antiquities. Marine archaeologists have found a dozen ancient coins from the archaic to the Roman period, Rhodian amphorae with stamped handles, as well as fossils of fishes and plants from the Levantine coast (northern Israel and southern Lebanon), that were part all of the Mentor's cargo. From the early 1800s onward, Greece and the Levant, with its beautiful gleaming ruined marble cities, were being popularized. Everyone wanted a piece of their history to display at home. 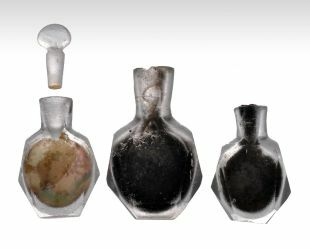 “The Mentor had previously been traveling along the Levantine coast to accumulate antiquities for collectors in Europe and carried other antiquities than the marbles onboard,” Kourkoumelis says. 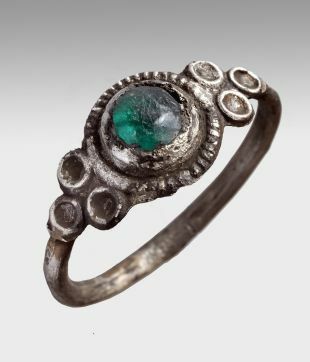 The divers also discovered several artifacts belonging to the ship's passengers and crew that can be tied to specific persons. 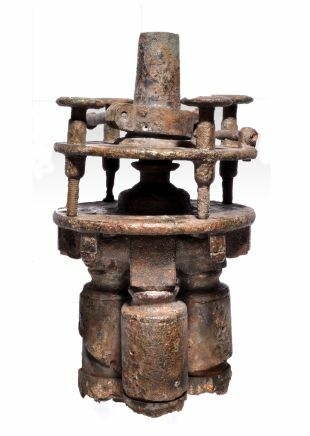 One was the base of a theodolite (an instrument for measuring angles in the horizontal and vertical planes), the equivalent of a modern-day total station, used to map topography. “On board ship was William Leak, a famous British topographer, who had made the topographical map of Zea in Piraeus, as well as some of the drawings of the Parthenon. This was probably the instrument he was using,” Kourkoumelis postulates. 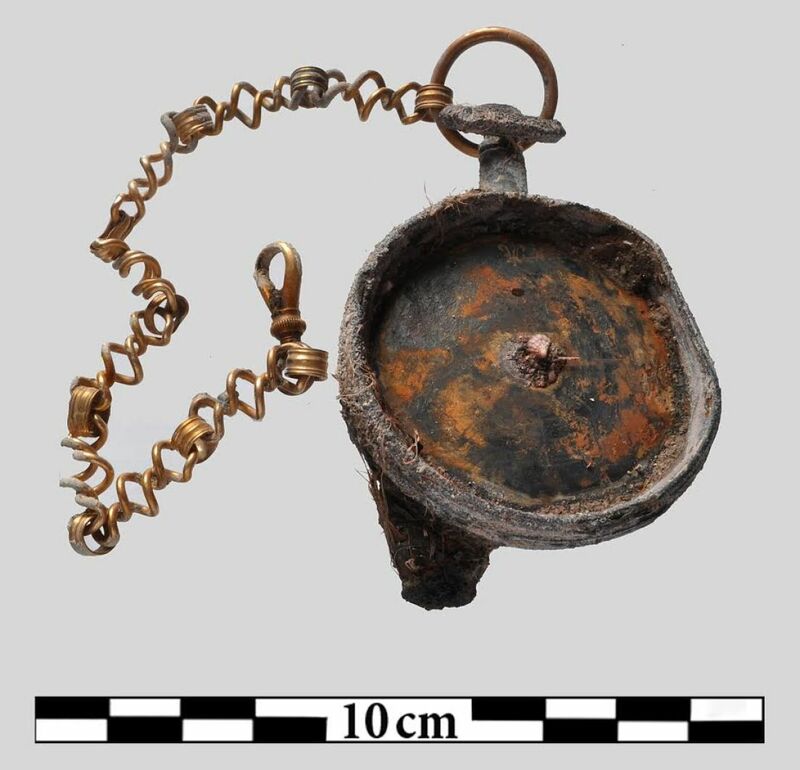 A compass, part of an hourglass and calipers used in navigating the ship were also found, along with watches manufactured in London, and glassware (drinking cups, vessels and bottles) and porcelain china used by the crew. 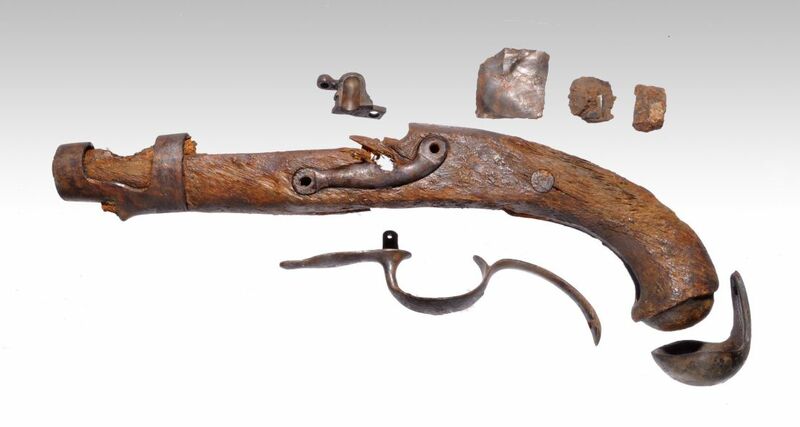 Additional discoveries included three pistols, and a large number of lead bullets, flints and a cannon ball, though the cannon itself was probably salvaged in 1802. The fact that the ship carried not only a bulky cargo but also weapons is indicative of the political instability in the eastern Mediterranean at the time. 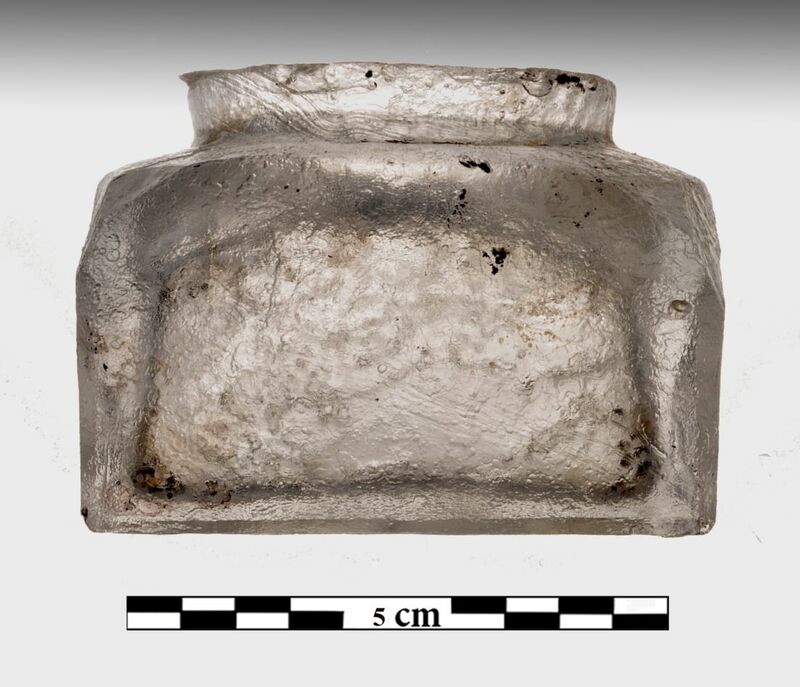 Most interestingly, parts of an Egyptian statue and a fragment of an Egyptian inscription were discovered, thanks to an extraordinary practice. “In Egypt, especially Alexandria, they were selling ancient stone statues of Egyptian pharaohs that were used as ballast on the ships. Afterwards, when they reached port, they would take out the ballast and sell the statues to collectors,” he said. Next season the diving archaeologists intend to explore the bow of the Mentor, hoping to uncover more antiquities may lie buried in the seabed. “We always hope to find some fragments or pieces of the marbles that were broken and left on the seabed, awaiting discovery,” Kourkoumelis says. In 1816, short of money, Lord Elgin sold the Parthenon Marbles to the British government. From the following year, 1817 the sculptures, have been on display in the permanent collection of the British Museum. Today, 200 years later, the controversy over the Elgin Marbles, or the "Parthenon Marbles" as those who think the British should give them back call them, is raging. To the Greeks, Elgin is an aesthetic criminal who looted their antiquities, wresting the marbles from their cultural setting. To others, he was a savior of the endangered Parthenon Frieze. It does bear remembering that in his day, locals were merrily walking off with bits of the Acropolis temple to burn in lime kilns or for reuse in their homes. The most recent chapter in the battle began with the building of the new Acropolis Museum in Athens. Most of the marbles on display are cast copies of the originals sitting in the British Museum (and the Louvre in Paris). Nonetheless, the first controversy of the Parthenon goes way back, to its dedication in 438 B.C.E. The Parthenon was the centerpiece of an ambitious building program on the Acropolis at the initiative of the Athenian statesman Pericles, and was an important part of his economic policies. The money for the construction work was taken from the Athens maritime organization, the Delian League, to which all the Ionic cites and islands belonged, and in which Athens held the political and military lead. In practice, though, the league consisted of Athens and taxpaying vassals just waiting to regain their freedom. The construction works provided employment for a variety of people for a few years, but then, unemployment began to threaten the republic of Athens. The Parthenon's completion was extremely fast: It was built in a mere nine years, which is incomprehensible to any modern tourist visiting the flat-bedded rock towering above central Athens. That the rapid construction had stood up well was already noted in antiquity. The Parthenon met with a fair amount of opposition while it was being constructed; some felt, not without reason, that it was not right to use the federal (union) treasury for municipal purposes in Athens. Pericles answered that as long as Athens was fulfilling its defense obligations, it owed no accounting to its allies over its use of the tribute. But the criticism did not ebb, and Pericles was attacked both by satirists and in the general assembly. Finally, he appealed to the people: “Do you think too much money has been spent on this?” The people answered in chorus that they thought so. “Then,” Pericles said, "let the costs not stand on your behalf, but on mine, and let my name by inscribed onto the buildings.” A furor erupted, ending in a vote of confidence for Pericles. The Parthenon was an innovation in Greek masonry and arts, one of the greatest temples of the ancient world. It housed a 12-meter (40 feet) gold and ivory statue of Athena. As much as anything, the temple was a propaganda work that merged arts, religion and international finance; and it was standing statement of Athens' power and achievement, to its citizens and opponents alike. The sheer magnitude of the building, with eight columns in front and seventeen along each side, allowed an unparalleled amount of sculptural ornamentation. Along the entablature (the horizontal element that is supported above the outer columns were huge rectangular panels, called metopes, showing scenes from mythic battles. Gods strike down giants on the east front, men defeat the half-human, half-horse centaurs on the south and Greeks triumph over Amazons on the west and Trojans on the north. It was a visual commentary of how the cultured vanquished the savage (or the untamed). The pediments (the triangular upper part at either end), painted figures were used to depict important moments in Athena’s lore. On the east, above the front door, Athena Parthenos sprang full grown from the head of her father, Zeus, fully equipped with shield and spear. On the west, she contended with her uncle Poseidon for possession of Athens. Merely to walk around the temple was to get a lesson in Greek and Athenian civic history. Now to see history in the original, one has to visit the British Museum as well. The following archaeologists, technicians, professional divers and conservators participated in this underwater research: Dimitris Dimitriou, John Fardoulis, Brendan Foley, Manouel Kourkoumelis, Kosmas Koronaios, Scott Lemoth, Louis Mersenie, Aristeidis Michail, Phil Short, Gemma Smith, Theotokis Theodoulou, Alexandros Tourtas, Themistocles Troupakis, Petros Tsabourakis, Angelos Tsopanidis, Manolis Tzefronis. 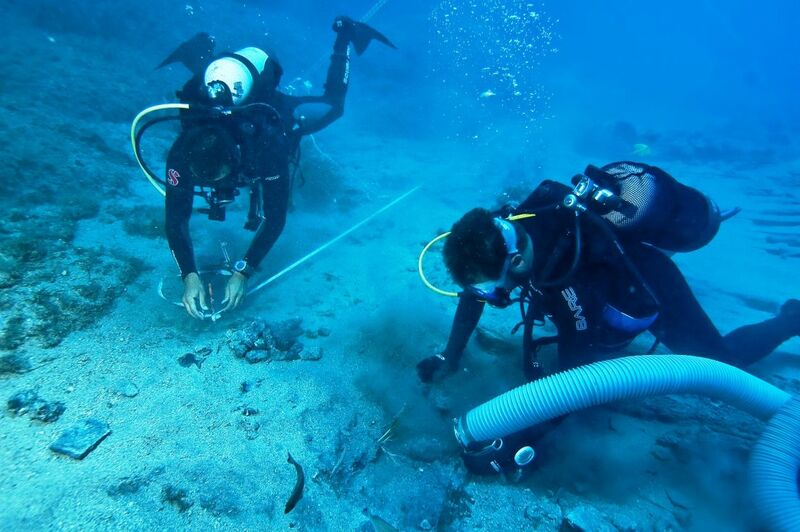 The conservation of the findings was done at the Ephorate of the Underwater Antiquities’s laboratories by Chryssa Fouseki, Angelos Tsopanidis and Antigone Leakou, as well as Ephorate’s drivers Giorgos Konstantopoulos, Charalambos Margaronis.